This beautiful Easter card is perfect for you to celebrate Easter Sunday. This elegant Easter design features a printed bunny and flowers panel hand-decorated with blue and clear crystals, finished with a hand tied brown and blue satin bow. A personalised Easter card that is sure to delight friends, family and loved ones. 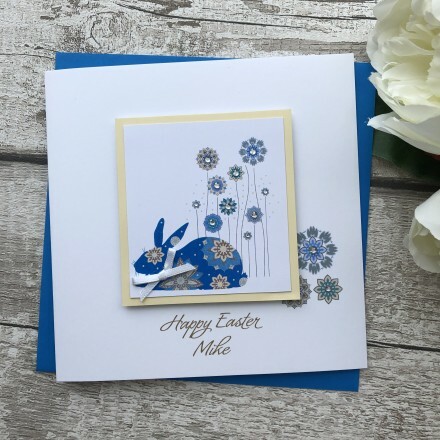 You can customise this card on the front and insert both left and right, to make this handmade Easter card extra special. This card can be personalised with your very own Easter message. Making your Pink and Posh card an Easter card to be cherished for years to come. Our Easter card collection has been made with love and designed with thought in the UK by us.